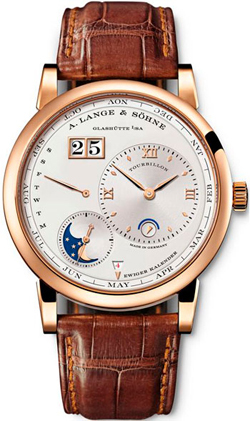 Recently, the famous watch company A. Lange & Sohne announced sales of the Lange 1 Tourbillon Perpetual Calendar in Russia. Note that there was an exhibition in Dresden, which was devoted to model Lange 1 Tourbillon Perpetual Calendar. Hours put in at the exposition “Green Vault”. The models were placed in nine halls of the Dresden castle. Tourbillon watches were put together with the astronomical clock desktop Jeremy Pfaff, made at the end of XVII century. Next to the time Lange 1 Tourbillon Perpetual Calendar in the museum were exhibited as other models of the company.